ABB MotiFlex e180 Servo Drive - ABB Inc. 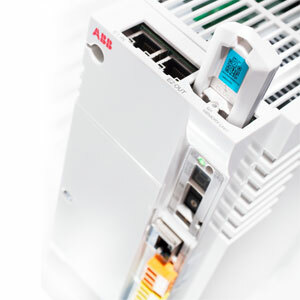 The compact memory unit stores all Drive settings, parameters and application programs. It allows preparing drive settings off-site, manage functionality levels, move settings from one drive to another without a PC and quick maintenance and service with a replacement Drive. The MotiFlex e180 can operate from 200 to 480 V AC three-phase with motor rms current range from 3 to 40 A 300% (3s) Servo duty.